Las Vegas is where new trends in resorts and hospitality begin, and BestofVegas.com lists of the five newest hotels that will change the face of the Las Vegas Strip once again. 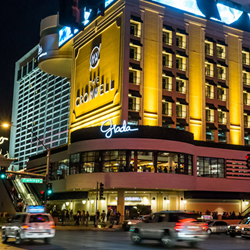 The Cromwell Las Vegas - one of the newest resorts changing the face of the Strip. Las Vegas is constantly noted as one of the most contemporary vacation spots on Earth. With new crowds, and new trends flowing through the city every day, it’s no surprise that the Las Vegas Strip is always introducing jet setting resorts and casinos. The newest, and hottest spots in Las Vegas are great for booking a stay, grabbing a bite, experiencing top-notch entertainment, or simply just exploring. Visiting these brand new Vegas locations will add an exciting edge to any vacation. After its opening in May of 2014, the Cromwell Hotel became Las Vegas’s first boutique hotel. Parisian-style architecture, along with a romantic interior design make The Cromwell a one of a kind resort. The very exclusive hotel offers a VIP experience to each one of its guests through luxurious amenities, world-class dining, and entertainment. The Cromwell’s featured restaurant, Giada, cooks up fine Italian-style dishes created by celebrity chef, Giada De Laurentiis, while the rooftop club, Drai’s, doubles as day and nightclub to host endless parties and events. The Cromwell is ideal for travelers who are attracted to lavish side of Las Vegas. Opening in the fall season of 2014, the Delano is a luxury resort that will be located in the 43-story golden tower at the Mandalay Bay Resort Complex. The high-end, conceptual hotel opened its first location in Miami, FL, and now promises to extend the South Beach feel to the Las Vegas strip. Each highly sophisticated room is formatted as a suite, and offers different size and view options, including a suite with a panoramic view, and even a dog friendly suite. The Delano offers all the splendor of a boutique hotel, with the extravagance of the Mandalay Bay Resort right at its door step. The legendary new Las Vegas hotel opens its doors on August 23rd, 2014. The SLS Las Vegas pays homage to its predecessors with a contemporary twist on the classic, “Old Vegas” feel. This casino resort will offer every aspect of Las Vegas entertainment imaginable. Life is presented as the resort’s high-energy beach and nightclub, while Foxtail provides a more intimate, lounge setting both indoors, and by the pool. The SLS Las Vegas stays ahead of the game with dining and shopping, featuring restaurants such as Katsuya by Starck, Bazaar Meat by Jose Andres, and designer retail by Fred Segal. The SLS Las Vegas boasts the bold tagline, “History Made Here”. The trendy new Las Vegas hotel and casino plays hosts to some of the most hip social spots to hit Las Vegas this year. LINQ’s cutting edge hotel and casino were designed with a minimalistic and ultra-modern approach, creating a chic atmosphere throughout the entire establishment. The LINQ’s “backyard” features two new Vegas hot spots. The record-breaking High Roller Ferris Wheel, along with the famous Brooklyn Bowl concert venue ensure unforgettable experiences for travelers, with breathtaking views, and legendary musical talent. The LINQ is surrounded by popular bars, gourmet pastry shops and restaurants, unique shopping, and so much more. This new Las Vegas location will have its guests gushing for years to come. This recently confirmed Asian-themed resort is not set to open on the Las Vegas strip until 2016, but the wonder that Resorts World Las Vegas holds will have travelers on the edge of their seats, waiting for its arrival. Rumor has it, the prospective casino and resort will feature a Panda exhibit, as well as an indoor water park. Other exciting amenities are said to include an aquarium, bowling alley, endless shopping and dining, and a 4,000 seat theater. Las Vegas locals and guests alike are sure to be blown away by Resorts World Las Vegas, as this establishment is sure to change the future of the Las Vegas experience.